How Does Contactless Card Reader Work? 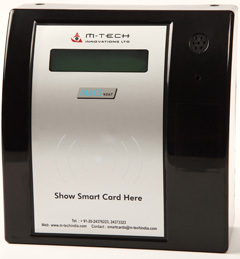 The contactless card reader connects with Standard Time Attendance software which comes with Leave/Shift management records with standard attendance reports. M-Tech Innovations has specially designed MTC as per the industry requirement and thus the solution offers scalability to manage multipurpose services. Multi Interface as - Only Card, Card + Pin etc. Optional card sensors as HF/ LF. Attendance report - Muster, Total Work Hrs., Extra Work Hrs., Late coming etc. Interconnects different cities with Central office. No need to maintain Attendance Register contactless cards allow paperless work. The device gives Readymade reports for Payroll Integration. Leave Management can be done automatically and easily. Cost effective solution to small/medium/large enterprises with lesser requirement of manual interference or monitoring.